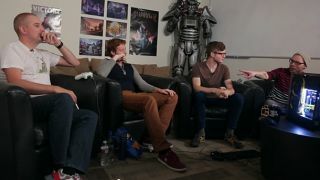 It's The PC Gamer Show ! In episode three we're introducing the new Large Pixel Collider Jr. with an afternoon of special living room gaming challenges. Can Counter-Strike maven Evan Lahti win when he's forced to play with an Xbox controller? Who will survive the frictionless mayhem of GTA 4's Carmageddon mod? Plus, we play upcoming electronic sport Videoball, and PC Gamer UK walks us through ARMA 3's awesome Zeus mode. Act I: As if Octodad: Dadliest Catch wasn't already wacky enough, Evan and Tyler race against Wes and global EIC Tim Clark in a competition to become the best co-op octo-pair. Act II: The gang goes two-on-two again in Videoball , Action Button Entertainment's upcoming minimalist electronic sport. Act III: Evan tests out his Counter-Strike skills by playing on the LPC Jr...with a controller. Meanwhile, Tyler plays with a keyboard and mouse, as any sane man would. Act IV: Our program heads over to the United Kingdom, where the other half of the PC Gamer team play Arma 3's Zeus mode . Vengeful god Andy Kelly controls the battlefield from above to torment his teammates. Act V: It's carmageddon in GTA4's famous no friction mod. We race through the chaos to see who can survive the longest in a whirlwind of flying cars.